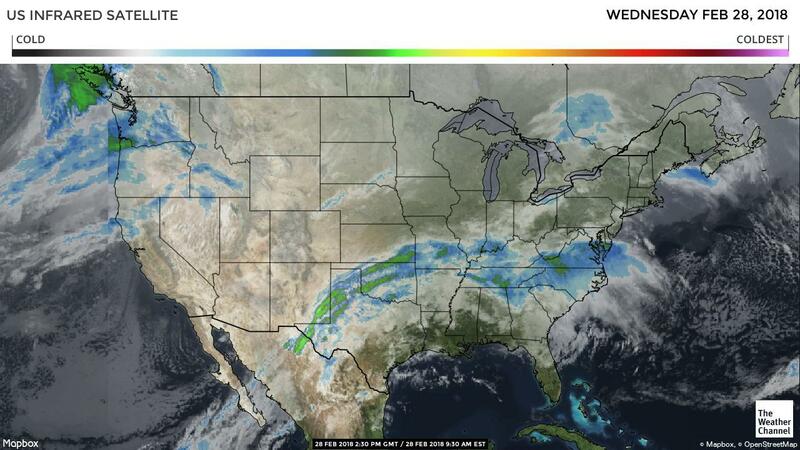 The late winter continues out west as a strong low pressure system moves in from the Gulf of Alaska mid-week. This looks to be one of the strongest and wettest storms of the year so far. The system moves into California late Wednesday with rain, strong winds and cold temperatures moving out of the region on Saturday. Cold morning temperatures continue in the Southwestern Desert regions for a few more days as this system passes to the north. A few light showers are possible across Mexico with above average temperatures expected into next week. Mostly dry conditions continue in Florida with slight cooling into the weekend due to a passing cold front. Stronger cold front looks to impact the area by the middle of next week. California trucks remain steady. Washington apple truck supply is adequate. Idaho onion/potato trucks are steady as well. The national average for diesel remained steady is currently at 3.007 per gallon. An increase of .430 from this time last year. 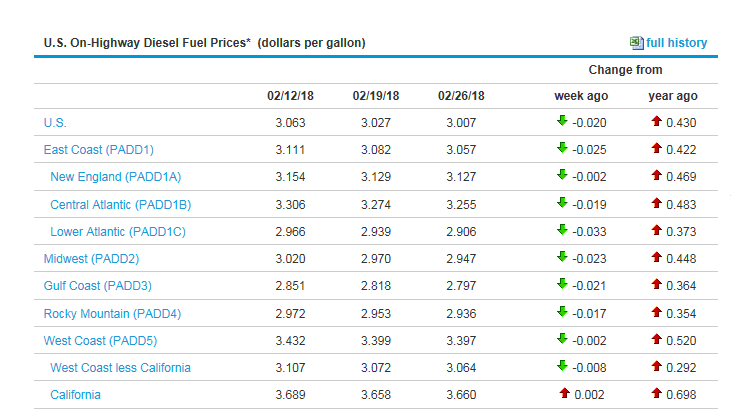 California prices remained steady and are now at 3.660 per gallon. Crude oil remained steady and is currently at 62.84 per barrel. Washington – Red Delicious, Golden Delicious, Granny Smith, Galas, and Fujis are all fairly steady with good volume of smaller fruit. Honeycrisp are slightly higher due to lighter supplies. The rising star varietals are mostly steady with a few volume deals on smaller fruit. The quality has been good for all. Idaho – Golden Delicious, Red Delicious, Granny Smith, and Pink Ladies are steady. Grannys are still peaking on 72/80/88s, Reds are peaking on 113/125s, and the Pinks and Goldens are peaking on 113/125/138s. The availability remains light due to light packing. The quality has been good. Michigan – Galas, McIntosh, Jonathans, Jonamacs, Golden Delicious, Red Delicious, Empires, Fujis, red Romes, Ida Reds, and Jonagolds are all steady. Supplies are still good but they are still anticipating an early finish to their season. The quality has been good. Pennsylvania – Fujis, Red Delicious, Golden Delicious, Cameos, Empires, Red Romes, and Pink Ladies remain steady but there has been some flex for volume on reds and golds. Red Delicious and Pink Ladies are peaking on 88/100s and the Fujis, Golds, Cameos, Empires, and Romes are peaking on 100/113s. The quality has been good. New York – Cortlands, Galas, McIntosh, Red Delicious, Fujis, Golden Delicious, Red Romes, Crispins, Pink Ladies, Empires, and Ruby Frost are all still available. Most of their fruit is large. The extra-fancy grade fruit is steady and the lower grade US#1's are steady but firm. Red Delicious, Galas, and Empires have been producing more smaller fruit than the rest. The quality has been good. Chilean Gala apples are scheduled to hit the east coast with 90 count and larger in approximately two weeks. all areas are in the peak of their seasons. Cold weather has slowed production in both Caborca, and San Luis, Mexico. We should see this trend continue for the next week to 10 days. The same cold weather has slowed production in Gonzales, CA. Overall markets are higher due to the colder weather. California is harvesting limited volume, with much of it being sold to overseas export. Greater harvest is expected to begin in March and increase weekly. Mexico's is harvesting good volume, which is skewed heavily toward smaller fruit and grade 2 fruit. We are expecting this trend to continue through March. 48s and larger sizes remain on the tighter side of supply. Eating quality is very good and fruit is ripening evenly. Warm weather in south Florida has caused growers to get ahead of schedule. The winter crop has been picked over and is now decreasing in volume, the spring crop is 10 days to 2 weeks away from being ready. Larger sizes are getting tighter as supplies are trending towards large, large medium and choice. Quality is fair with a lot of fruit showing scaring, age and turning color. The forecast for late this week shows cooling temperatures which could increase the gap. Expect supplies to tighten over the next week. bell pepper is moving out of peak season. Blackberry supplies are lighter than expected this week. Mexico has experienced cold weather and rain that has affected production anywhere from 10-20% daily. Additionally, transfer trucks are being delayed from Mexico, creating a short term gap in supply this week. All shippers seem to be in the same situation regardless of loading location. However, supplies are expect to improve by the weekend as fruit arrives from Mexico. Quality has been a real challenge this week with reports of wet and soft berries with occasional decay. Market prices have been steady. Moving forward, we expect production to improve in Mexico, followed by domestic production my Mid March. Supplies are very light this week due to limited production and delayed transfer trucks from Mexico. Domestic production is expected to start by mid March. No change in blueberry supplies or markets this week. Chilean and Mexican blueberries remain consistent. Quality has been solid, and markets have been steady. Over the next 3-4 weeks, we will see production start to transition back to domestic growing regions. Mid-March will mark the beginning of new harvest in Florida. Volumes will be light to start and ramp up quickly by the beginning of April. California will start shortly after with light harvest by late March and gradually ramp up through April. Georgia will get started early April and have promotable volumes by May. Overall, supplies are expected to remain steady through March; then we will see a jump in availability by April. Domestic production is expect to start by mid March. Raspberry supplies remain limited. Mexican production has been consistent but light. Quality is being reported as good. Market prices have been climbing gradually, but will level off this week and are expected to remain steady and firm. We expect supplies to remain light for the next 3 weeks. By mid March we will see a gradual increase in domestic production out of Oxnard and Santa Maria. Not much has changed on the overall strawberry situation this week. We continue to see segmented markets and supply situations. In California, Oxnard continues to be the main production area with Santa Maria slowly ramping up. The weather in Oxnard has remained cold, and production volumes are low. Quality is good, but we are seeing some reports of soft fruit due to the freeze last week. Market prices have remained steady. Mexican strawberries loading in McAllen have been consistent, but quality has been a challenge as weather has fluctuated. Soft wet fruit is being reported with occasional decay. Markets have been steady to lower with spot buy opportunities available to move volume. In Florida, we have seen the biggest swings in market price and quality. There have been some very aggressive offers being thrown around this area over the last week. However, there has also been some very poor quality fruit being harvested. The weather has been very warm and the fruit is tired. We expect market prices to remain low and quality to continue to be a challenge as we approach the end of the season. Santa Maria is slowly ramping up production and will continue to increase over the next 3 weeks. Salinas / Watsonville is starting to scratch the surface with light harvest, but is not expected to see any real volume for another 4-6 weeks. Florida will wind down and come to an end in the next 3 weeks. We are experiencing a supply shortage from all regions on broccoli. The much colder weather is the direct result of the shortage. Also the continued weather will not help that cause. As we will still see much colder than normal temperatures for the next 10 days. The market is trending much higher. Quality remains relatively good with decent crown size, minimal yellowing, or decay. The Salinas growing region has started this week with bunched broccoli but this has had no effect on the market. We are slowly transitioning to Salinas. They have started to pack bunched broccoli. We have finally seen a decrease in supplies this week. The market as a result is trending higher. The colder weather in Mexico and Oxnard has significantly slowed growth rates causing a drop in supplies. We will continue to see the market trend higher well into next week. Quality remains excellent with vibrant green color and no decay. Although jumbo sized brussel sprouts are limited. Supplies are steady, still not much size coming from fields, so jumbo size are still short. Organic fresh carrot production is improving. The cauliflower market is extremely active. The cold weather in Yuma and Santa Maria has significantly slowed growth and supplies. The quality has also suffered with black spotting, brown discoloration / bruising. The supply gap will last two to three weeks as we hope for warmer weather. The cauliflower market is extremely active due to weather conditions creating a supply gap. The cilantro supplies vary from each supplier and growing region as well. The Oxnard growing region seems to have more plentiful supplies versus Yuma and Mexico. The cold weather is also effecting supplies. So we have a two tiered market. Quality is hit and miss with some yellow to brown leaves as well as freeze damage from Mexico. The Central Valley crop is in full production and half way complete with 57% of the crop in house. Sizing is large peaking 115s/95s/140s, mostly fancy grade. Ventura crop is picking up the pace with better production, with estimates of peak sizing on 140s and smaller fruit, heavy to choice grade. Lime supplies continue to be very short. The cold weather has led to very limited supplies and Mexican growers continue to send fruit to Europe and Asia, leaving the US in a supply gap. Market prices have steadily been climbing and are expected to continue to increase this week. Quality and supplies will be a challenge for the next several weeks. Advance notice for orders and flexibility on load/delivery dates will be necessary. We continue to see limited supplies and increased markets. Navel crop continues to peak on 72s/56s and looks to through the season. 88s/113s/138s continue to be very slim in pack outs. Pack-outs remain clean with good color resulting in grade ratio of 80% to 85% of Fancy fruit. Fruit is eating great. Wet weather is going to be an issue; a larger wet front is moving in bringing good rains Wednesday through Friday, which will cause disruption in picking fruit. A combination of things is causing the cucumber market to rise sharply. As we thought growers in Honduras cut back on shipments to the U.S. because prices have been very low, so supply has been reduced. A cold snap in the growing regions in Mexico has caused damage to plants and greatly reduced production sending buyers east to load import cucumbers. Expect the markets to continue to get stronger as the week goes on. Very cold weather in Mexico has caused the import cucumber market to rise sharply. Cucumbers are moving out of peak season. There is simply not a lot of eggplant grown in south Florida this time of year. Florida is traditionally windy during the winter and this year has been especially so, which makes it difficult to grow good eggplant that is free of bruising and scaring. Good eggplant has been difficult to find, quality varies from shipper to shipper. The market this time of year is normally dictated by Mexico but with recent cold weather less volume has been crossing the border. Eggplant supplies are tight, quality varies a lot from shipper to shipper. Eggplant is not in Peak season. The green grape market is stable with moderate supply. Volume is stable with product available in storage. There are a wide variety of sizes and varieties available. Quality will be constantly good for the remainder of the Chilean season. The red grape market is stable with plenty of product. Volume is stable with product available in storage. There are a wide variety of sizes and varieties available. Quality is slowly getting better and more consistent, as low quality red grapes have finally moved out of the marketplace. Quality should remain good for the remainder of the Chilean season. The cold snap that occurred last week will definitely hurt supplies and quality. We are now seeing arrivals showing brown to yellow tops from the freeze damage. The market is also reacting and trending higher. Jumbo sized green onions are basically non existent with the majority of crossing from Mexico resulting in small to medium sizes. We continue to see good supplies of kale from all growing regions. The market remains flat and competitive. The quality is excellent with full bunches, dark green color, and minimal yellowing. Supplies are lighter in the desert. This market is active. The cold weather has caused multiple defects to occur with this commodity. Frost damage, brown blight, decay, mechanical and misshapen heads are being reported. Supplies will be up and down for the month of March as the gap in production we were expecting has started. The weights on liner are averaging 40-44 pounds. Temperatures will have lows of the 30s to 40s for the week in Yuma. Cooler weather and gaps in production has romaine as well as green leaf light in availability for the entire week. Red leaf and butter have moderate availability. Common defects include ribbing, twisting, blister and peel as well as mechanical. Light supplies are expected for the next two weeks minimum followed up by inconsistent production for the rest of the month of March. The gap that was anticipated is here. This market is active and expect stronger markets next week as well. Temperatures in Santa Maria/Oxnard as well as Yuma will have low temperatures in the 30s-40s. Southern California will have rain as well through the week. The previous cold weather in Yuma has caused a significant slow down in growth patterns. The lettuce ice has also taken its toll on quality as well. We will see more wetness, breakdown in red components, yellowing, and some decay in all packs. The market will trend higher as we finish the Yuma season. The cantaloupe market is steady on all sizes. Most shippers are still peaking on 9s and jumbo 9s. South Florida still has the best availability for all sizes. The east coast, Houston, and Los Angeles have mostly larger fruit. We expect sizing to remain steady. The quality has been good. Zacapa, Guatemala is back into production. Honduras is still in the peak of its season. Honeydews are steady on both coasts. Florida still has the most volume and largest mix of sizes. The east coast, Houston, and Los Angeles are more limited in sizes and quantities. Most packers are peaking on 5s and 6s with only a few 8s. The quality has been good. Honduras is in the peak of its season. Market is slightly weaker and unsettled out of loading areas (Idaho, Washington, Colorado and South Texas). Mainly do to lighter demand and building supplies out of Mexico. Quality coming out of the storages is still looking very nice. There is an occasional lot showing some light translucency in the outer layers mainly in the larger yellow onions. New crop Mexican onions have been looking nice with better volume crossing each week. Sizing is peaking on Jumbos and all colors are available. Transportation has improve out of loading areas. Pricing is a little unsettled depending on the lane. Washington – only a couple of suppliers still have Bartletts and supplies are extremely limited. D'anjou pears are slightly lower on 90s and larger, steady on 100/110s, and slightly higher on 120s and smaller. Small fancy-grade fruit is also very limited. Bosc pears are steady on the larger fruit and steady but strong on 110-size and smaller due to light supplies. Bosc continue to peak on US#1 80/90s. Red D'anjous are steady on all sizes. Reds are still peaking on 40/45/50 half cartons. The quality for all has been good. Offshore – the Chilean Bartlett market is lower as the availability continues to improve on both coasts. The fruit continues to peak on 90/100s. Argentinian fruit has started to arrive and on both coasts. The Argentinian fruit is steady and is priced at a premium relative to the Chilean. The quality has been good. Washington is in the peak of its D'anjou, Bosc, and red D'anjou seasons. Volume from the tropics is good and look to be so going forward through March. Demand is light on all sizes of cartons with a slightly weaker market. I feel that we are close to finding a the right trading level. Quality overall is looking good for this time of the year. Transportations have gotten better which has stabilized rates. Supplies are still shipping out of Idaho, Washington, Colorado and Wisconsin. Western Washington – red and gold potatoes are steady. A-size is still the peak size for both colors. They expect to pack until the end of March to the middle of April. The quality has been good. Eastern Washington – red and gold potatoes are steady and are still peaking on A-size. The availability is limited for both. The quality has been good. Bakersfield, California – reds and golds are steady on all sizes. White potatoes are steady to lower. All colors are peaking on A-size. The quality has been good. Idaho – reds and golds are steady. Some shippers will flex on A size reds. Both colors are peaking on A-size. The quality has been good. Wisconsin – red and gold potatoes are steady. Both colors are peaking on A-size. The quality has been good. North Dakota – red and gold potatoes are steady on all sizes. The quality has been good. South Florida – red and gold potatoes are steady on all sizes. White potatoes are slightly lower due to increased volume. The quality has been good. Western Washington, Idaho, North Dakota, and Florida are all in the peak of their seasons. Squash plants go through cycles of high production and low production and we have entered a cycle of low production. Another reason is lack of bee production which traditionally happens when the tropical plants in south Florida start to bloom. Tropical plants produce a sweeter sent and pull bees away from squash plants. Cold weather has caused lower production in Mexico putting more pressure on eastern shippers. Squash is out of peak season. Availability of Chilean peaches, nectarines, and plums continues to be light. Ship arrivals have been hit or miss. Sizing on peaches and nectarines are mostly in tray pack 48/50's and 54/56's with very few volume fill 60's and 70's. The market remains steady with good quality. Peaches will be wrapping up in the next 2-3 weeks, nectarines in the next 4-5 weeks, with plums for another 8 weeks. Quality will remain good for the remainder of the Chilean season. Florida is experiencing a bit of a slow down as a result of bloom drop 6 weeks ago. With slightly less coming out of the fields, markets have increased buy $1 to $2 against steady winter demand. XL rounds are at a premium with smaller fruit selling slightly cheaper. Roma tomatoes are available in Florida, but Mexico continues with an abundance of imports flooding the marketplace raising concern over quality and condition as shippers struggle to keep cases moving out of their doors. Similarly, grape and cherry tomatoes struggle to find any strength this week with both east and west promoting Grape and cherry tomatoes. Overall the market is steady with harvest forecasted to pick up again next week which will ease prices in the market place again by mid month. Pending a detrimental weather event, supply is expected to remain steady through Spring. Favorable weather in Mexico continues to flood the border with loads of fruit crossing Nogales, AZ daily. Similar to round varieties, there is a greater supply of roma tomatoes than demand keeping markets steady at mandated minimums for the foreseeable future. While demand in the United states is slow for winter, Mexico continues to bring heavy volume of tomatoes priced at mandated minimums. Roma tomatoes continue to increase week after week driving prices downward. Similarly Grape and cherry tomatoes are affordable with a preference for the eastern grown counterpart where condition is more consistent through lots.